You could say our Allure Films crew was blinded by science and love on Nikki & Jordan’s wedding day. Not everyone gets to marry the love of their life under a sky full of stars and a full moon, but at the Franklin Institute, anything is possible! 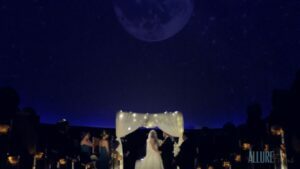 It was quite the experience for our team to document the couple’s wedding ceremony in the Franklin Institute’s Fels Planetarium. This particular ceremony was unique in many ways other than the awe-inspiring location. The bride and groom’s sweet vows to each other incorporated their Jewish and Gaelic heritages, and it was clear that they were truly written from the heart. The ceremony was followed by a cocktail hour in the museum’s Electricity exhibit, where wedding guests noshed on incredible bites catered by Frog Commissary. This cocktail hour was an equally “electrifying” experience for our filmmakers and the guests – friends and family watched in amazement as they literally lit up the sustainable dance floor with their moves! This is one of the things that we love the most about one-of-a-kind venues like the Franklin Institute. We’re big fans of spaces that engage guests, allowing them to feel like they are a part of the big day in more ways than as just a spectator. At the Franklin Institute, Nikki and Jordan’s friends and family were able to participate in activities that were fun, educational, and exciting as they wandered the halls during cocktail hour. Carl Alan Floral Design was behind all of the stunning floral arrangements, from the bride’s bouquet, to the table centerpieces and more! For the reception, we joined the guests in Ben Franklin Memorial room, where the infamous Founding Father himself looked on as everyone danced the night away in celebration thanks to great sound provided by Synergetic Sound. Congratulations Nikki & Jordan, and best wishes for a fun-filled future together! Contact a representative from Allure Films today to learn more about our wedding videography packages. For Heather-Anne and Jules’ wedding, the Allure Films crew found ourselves back at the Phoenixville Foundry for an evening of love, laughter and fire dancing. That’s right, fire dancing! Aside from each other, this bride and groom share a passion for fire dancing. Talk about upping the entertainment ante for your guests! We bet it was the first time many of the couple’s guests got to enjoy such riveting acts at a wedding. It was such a privilege for both our filmmakers and for the photographers from Philip Gabriel Photography to capture these amazing performances. The wedding began with the couple’s non-clergy ceremony before their friends and family in the venue’s lovely Sculpture Garden. The Foundry’s Sculpture Garden provides a perfect ambiance for an outdoor sunset ceremony. For those who don’t know, a non-clergy wedding is when the bride and groom officiate their own marriage without a third party clergy member. This allowed for the bride and groom’s vows to be truly their own, giving them the chance to reflect on their love and devotion to one another. We also want to give an honorable mention to the bridal party’s twist on the traditional bouquet. Instead of holding a full floral bouquet, the bride walked down the aisle holding a lantern that lit her way, designed in collaboration with the couple’s floral designer Carl Alan Designs. Truly a unique touch! At the reception, the dance floor of the Phoenixville Foundry’s Cupola Ballroom was packed thanks to fabulous music by the Silver Sound Entertainment. 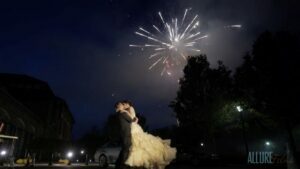 To close the celebration, Heather-Anne and Jules had surprised their guests with the perfect ending to their big night with a beautiful firework display. This was truly a wedding full of sparks in every sense of the word. Congratulations Heather-Anne and Jules, and here’s to a lifetime together filled with love and adventure! Contact Allure Films for more information on our wedding videography packages. Feelings of love and celebration filled the air of the Westin Hotel Philadelphia on Carly and Jeremy’s wedding day. One of the unique factors about their wedding was that the wedding prep, ceremony and reception all took place inside the hotel. Talk about convenience for both the wedding party and their guests! As soon as Jeremy smashed the glass at the end of the ceremony, it was time to party! In addition to creating the breathtaking chuppah, Carl Alan Floral Designs also helped transform the hotel’s Grand Ballroom to a space fit for a dream reception, including submerged floral and candle centerpieces at every table. After a delicious meal, the guests were dancing all night to great music by EBE’s LA Starz. Mazel Tov Carly & Jeremy, and here’s to love and all your future adventures together! Click here for more information about Allure Films’ wedding videography packages. Lara and Jonathan, thank you so much for allowing us to capture all the magical moments from your wedding day. Our bride and groom were exchanging loving smiles from start to finish. Their ceremony and reception took place at the elegant Crystal Tea Room. It’s always incredible to see the room transform into a whole new scene! Carl Alan did a top notch job in providing breathtaking decor. Susan Stripling was there to capture each moment as it unfolded. Family and friends shared touching words with these newlyweds. The Queen of Hearts did an amazing job in helping prepare for this big day! Check out a preview of Lara and Jonathan’s wedding day. Congrats newlyweds, from the entire Allure team.